Marc Lewis, PhD, is a neuroscientist and professor of developmental psychology. He has authored or coauthored more than fifty journal articles in neuroscience and developmental psychology. 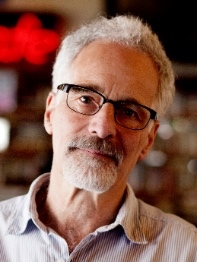 Presently, he speaks and blogs on topics in addiction science, and his critically acclaimed book, Memoirs of an Addicted Brain, is the first to blend memoir and science in addiction studies. 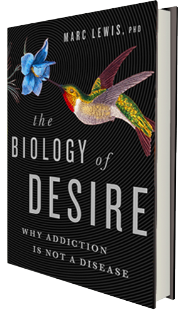 His newly released book, The Biology of Desire, debunks the currently popular disease model of addiction. “This is the real story of ‘this is your brain on drugs,’ but one that provides a refreshing, convincing alternative to the widespread traditional disease-model view of addiction. Through compelling stories of real people who struggled with various addictions, Lewis lucidly makes the case for a new science-based understanding of what causes and sustains addiction…and offers far more positivity about ways out…”—Anne M. Fletcher, M.S., author of NY Times best-selling books, Sober for Good, Inside Rehab, and Thin for Life. "Even when presenting more technical information, Lewis shows a keen ability to put a human face on the most groundbreaking research into addiction. Likewise, he manages to make complex findings and theories both comprehensible and interesting." "What gives Lewis an edge are his impeccable, Oliver Sacks-like case studies sprinkled throughout the book, which demonstrate his understanding of and fascination with the experience of drug users." "Lewis’s argument is actually fairly simple: The disease theory, and the science sometimes used to support it, fail to take into account the plasticity of the human brain." 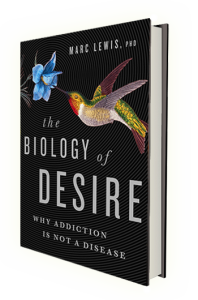 "An intellectually authoritative yet controversial declaration that substance and behavioral dependencies are swiftly and deeply learned via the “neural circuitry of desire.”"
"As Mr. Lewis stresses throughout this unorthodox but enlightening book, people learn to be addicts, and, with effort, they can learn not to be addicts, too." "The Biology of Desire focuses relentlessly on the chemistry of the brain. That is what makes it the most important study of addiction to be published for many years." "This memoir is as strange, immediate and artfully written as any Oliver Sacks case-study, with the added scintillation of having been composed by its subject." "And the picture of his brain activity with which Lewis furnishes us is at just the right resolution for an interested lay reader. He patiently guides along the bidirectional neural pathways that explain how an addict gets caught in a feedback loop of anticipatory craving." "Memoirs of an Addicted Brain may be the most original and illuminating addiction memoir since Thomas De Quincey's seminal Confessions of an Opium Eater."